Hello! We at Milaana are very excited to share the first of many Milaana success stories of connection! Each story will be unique and aims to showcase the amazing students and organisations out there and the awesome things that happen when they connect! ENJOY! Matt, Bek and another team member from the Cropfest Event! 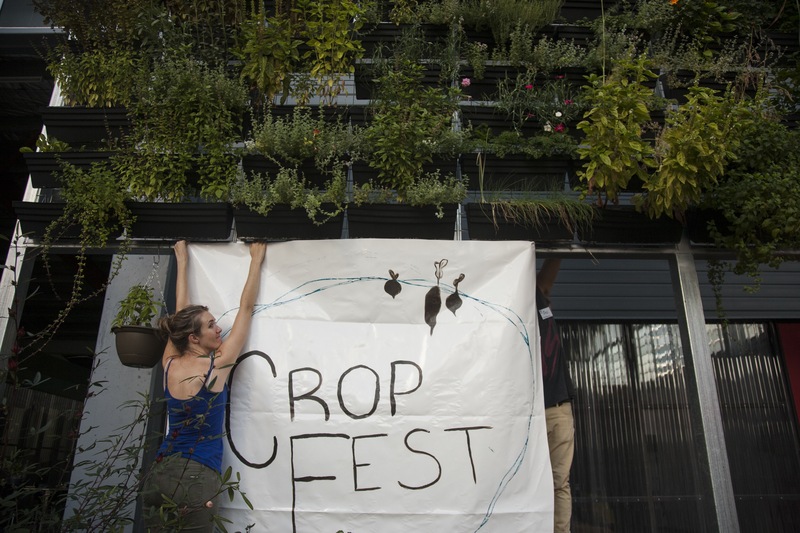 Project : Cropfest was an incarnation of the ‘Disco Soup’ idea hailing from Germany; taking perfectly edible vegetables – though not fitting the strict supermarket appearance guidlines – and creating a large shared meal with live music for all members of the community! Goals & Objectives: Cropfest sought to raise awareness of the systemic wastage involved in our current food system bought about by the unsustainable standards of retailers within the industry. Reminding us, the consumers, that the power for positive change is in our hands. They needed someone on the day to capture the feel and vibe of the whole event and document the guests ideas and feelings surrounding food waste and the current food system. To find this wonderful person, they used Milaana! I stumbled across photography a little over two years ago now while lying around home with a freshly reconstructed knee and after months of studying the work of some of the greats of the last century, I was hooked, and haven’t looked back since. Last year I moved to Brisbane and enrolled in a Bachelor of Photography (majoring in photojournalism) at the Queensland College of Art, Southbank. Beyond this however, I’d love to work documenting the collective stories that shape our lives, and the lives that ultimately shape these stories. What did you work on for this project? For this project I photographed the event from start to finish, trying to document all aspects of the night. The photographs were then used in an online event gallery and incorporated into an afterfim. It was a great experience for me. Having never worked in an event environment before I learned a lot about positioning and working to a schedule. How did this help prepare you for future employment? As I’d never undertaken any photographic ‘work’ prior, the experience really pulled me out of my comfort zone at the time and gave me knowledge that I can go out and produce images that an employer will be happy with. The skills gained from photographing an event have also proved very handy in my own work, and my connection with Youth Food Movement is now allowing me the opportunity to be involved in future events. Meeting the crew of Youth Food Movement here in Brisbane, and becoming aware of the groundswell of this kind of thinking in the local area was incredibly interesting and uplifting. Meeting many people on the night, other opportunities and relationships have arisen since – something I never expected. How has this project changed/shaped your views on community engagement? Coming from a small rural town I’ve always believed that strong community engagement is a truly wonderful thing. This was the first ‘community’ event I had participated in since moving to Brisbane to study and it is great to see those kind of things are possible in the hear of the city – especially around a cause as impoprtant as this. Any advice for other interns undertaking impact placements? Don’t overthink it; don’t doubt yourself; don’t even worry that you may not be the right person for the job (if someone is willing to take you on chances are that you are capable); it’s all about getting out there in the community for a good reason and reaching people you would not have reached otherwise. What do you like most about Milaana? Finding work that you can be passionate about is hard these days, and finding experience that is relevant to your study is often harder still – Milaana hands you both. The students and job-seekers are out there waiting; you’ve built it and we will definitely come, we just need to know you exist! A strong presence on both social media and campuses would be the best way! MEET Bek from Youth Food Movement! What is Youth Food Movement? All young Australians have the capacity and motivation to make food choices that demand and support a healthy and secure food system. YFM aims to be a nation-wide movement that brings young people together around food. We strive to make our generation aware of their power as conscious consumers by building understanding and value for the food we eat. We also aspire to be a collective voice for young Australians so that together we can have our say in the decisions that impact our food future. Why was this project important to your organisation? This project was our debut event in Brisbane and enabled us to be able to share with community what we are passionate about. We also (of course) wanted to raise awarness about the issue of food standardisation and food waste which is only a small part of the huge problem we face within our food system. How did this project contribute to the community? It allowed people to come and understand what really happens to our food from farm to table and let people experience and taste the food that would normally be thrown away. This gives people a knew understanding of our food system and the people who grow it, thus empowering them to make better food choices, which then eventually helps farmers and the wider community. How did Matt contribute to the event? Matt was great! If we didnt have him we wouldnt of captured anything of the evening. As this was our first event all the planning coming up to it was pretty intense and we had no time to do it ourselves. He engaged with the crowd very well, was always smiling and took some great shots which we had to use for the afterfilm.. which we will now use for promotion! Matt is kind and friendly, easy to talk to and very cruisy. Usually on time, but always on the ball when needed to be. He is also keen to get involved with future events and his contributtion(not just the photography) has been priceless! What were you able to offer Matt in terms of experience? I guess we gave Matt a new kind of experience. We enabled him to learn some new skills and also have been able to provide him with a certificate of appreciation that he can add to his portfolio. Nothing really. All went smoothly! I woud get another guy in for film though! Any advice for other orgs taking on interns? Look after your guys so that they can take experience from their work with you and make sure they feel like apart of the team, not just someone who works for you. Matt is now involved with our future stuff and its great to have him on board. How did you find your experience with Milaana? Any future project for students to keep an eye out for? I LOVE Milaana! Such a great idea and such a good cause for the community. Hollie is also awesomely nice! We do! Reel Food Nights is our next event coming up on 30th Aug @ Wandering Cooks. We will be needing some more people for volunteering and also to futher the organisation while I am away in India. A HUGE MILAANA THANK YOU TO MATT AND BEK FOR SHARING THEIR STORY!! A huge part of Milaana will be sharing these stories of community engagement and impact to inspire more orgs and students to get involved! Visit www.milaana.org to see what great projects are waiting for you and become our next wonderful success story to share!